Today we were supposed to start the Achtung! 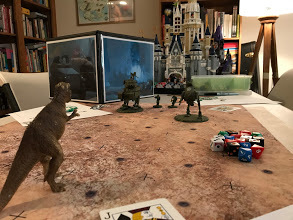 Cthulhu/Dust campaign but the session turned into more clarification on Walker combat – plus a lot of history on the settings of both Achtung! Cthulhu and Dust. So, it wasn’t a complete waste of time. 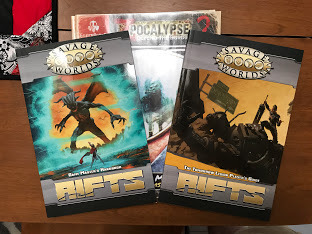 In fact, because someone had the Rifts core books, we were able to further refine Walker combat. So here is version 2 which is much better having read The Tomorrow Legion Player’s Guide and having played through various situations with four Walkers. Basically, Rifts (which calls Walkers Robot Armor) does away with Top Speed and replaces it with the option to run using 2d6. 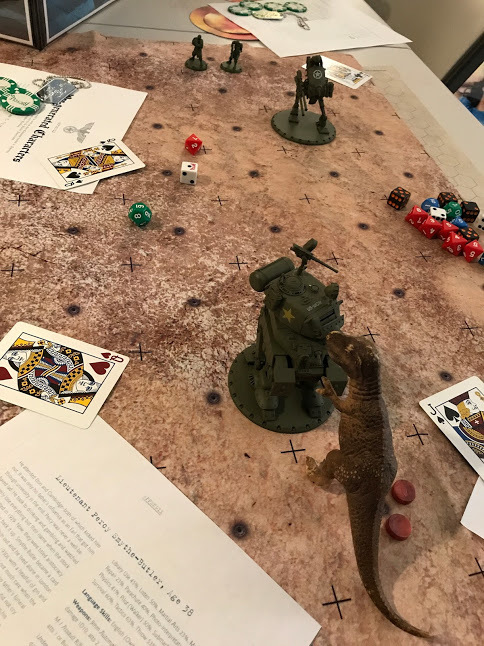 This is much simpler and it is what we used for our test skirmish with T-Rex! Our battle began with the Mickey pilot, Lt. Percy, doing a Death from Above maneuver. It was highly successful and way cool! T-Rex didn’t go down without a fight, though. He was stomped on and suffered 3 wounds. He Soaked 1 wound and I spent another Benny to remove the Shaken status. He still had 2 wounds but he has the Improved Nerves of Steel Edge, which just so happens to eliminate 2 points of wound penalty. T-Rex tore into the Mickey and actually left Lt Percy Shaken. Unfortunately, the battle did’t last long enough for me to attempt to swallow either Captain Miner (who is a Major select, so he is technically Major Miner, ha ha) or Bodine, who were on foot. It was still a fun battle and everyone is completely up to speed on how we are going to be running Walker battles. It can be spent to gain one completely free additional Action (doesn’t incur a Multi Action Penalty but other penalties still apply). Finally, I created a spreadsheet with three new Walkers for use with Savage Worlds. They were made to match the exact Walkers and their configurations that I have miniatures for.